Brockhurst Lodge is ideally located north of Gosport town centre. It's a quaint house, built in 1880 and typical of properties in this area. It's been fully refurbished to a very high standard with everything you might need to enjoy a comfortable stay, be it for business or leisure. The house can sleep a maximum of 5 people. There are two bedrooms, a double and a single and there is a comfortable double sofa bed in the living room. A travel cot can be put up in the double room for one small child up to 2 years old, if required. The elegant bathroom has a full sized P-shaped bath with over head shower. 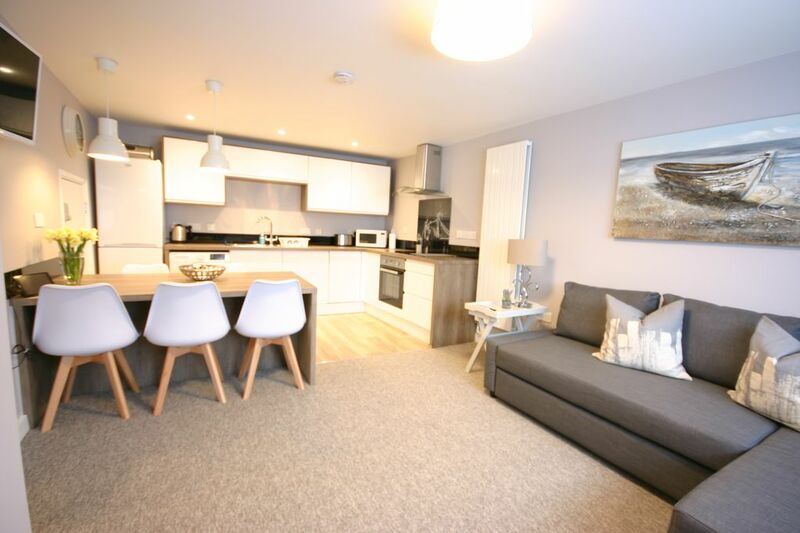 There is a fully stocked kitchen with all the mod cons you might need including dishwasher, oven/hob and microwave plus there is free wifi and a smart TV with DVD player. There is a small allocated parking space in the street behind the block suitable for a small car but guests will also be provided with a map showing the alternative parking options in their pre-arrival information email. There is a selection of tea and coffee with fresh milk and biscuits with our compliments. A continental breakfast hamper can be ordered at an extra charge of £6 per booked guest (minimum order is 2) - contact us directly to arrange this. Gosport has a rich Naval history which is closely linked to the Portsmouth Historic Dockyard, just a short 5 minute ferry ride across the harbour. Gosport is also home to some of the best marinas in the Solent and it's a lovely place to while away a few hours at one of the cafes watching the passing boats, navel vessels and continental passenger ferries. The beach at Stokes Bay offers visitors a host of recreational opportunities from sailing, paddle boarding, swimming, fishing, walking, playing mini-golf or enjoying a bite to eat at one of the beachfront eateries with lovely views across the Solent, towards the Isle of Wight. If you're looking for some retail therapy there is no easier way to get to the designer outlet shopping offered at Gunwarf Quays than by ferry from Gosport - it takes just minutes and runs from early morning until late at night. There is also a cinema complex, ten-pin bowling and a number of restaurants, bars and cafes to suit all tastes. Please be aware that the house is on the A32 which is the busy main road into Gosport and some traffic noise can be heard at peak times but every effort has been made to limit the impact of the road noise on our guests. There are a few DVD's available for guests to use during their stay.